You did it. You just said something you regret. You just doled out some punishment you really don’t want to see through (or something you literally cannot see through). Ugh. It happens to us sometimes as parents! We are surprised by some behavior and we respond basically without thinking and we are soon regretting our response (whether we picked a bad punishment, we yelled, we were grumpy, or something else). 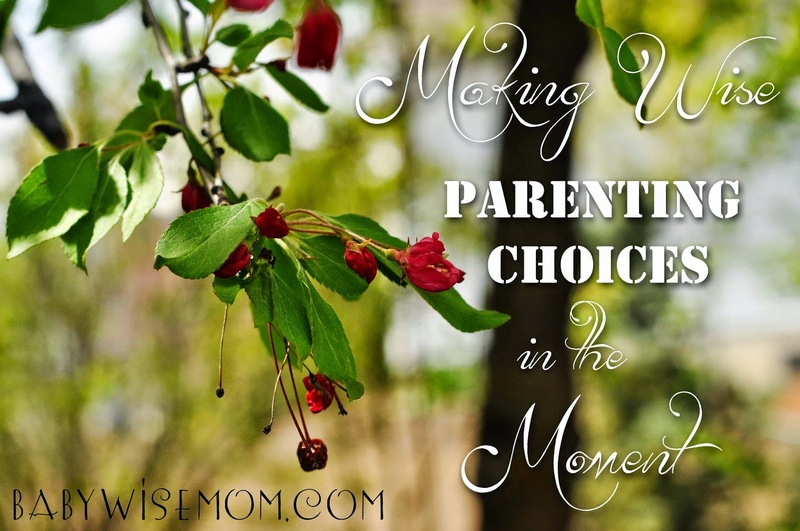 How do we make wise parenting choices in the heat of the moment? You know that advice to count to ten before you respond when you are mad? It is perfectly acceptable to close your eyes, take a deep breath, and count to ten before you respond in any way (of course assuming the situation is safe enough for you to do so). Let yourself cool off. Give yourself a time out if needed! Give yourself some time to get your composure together so you can think. You don’t need to appear to be some all-knowing being that can respond perfectly in any given moment. Often times, children are hoping for some emotional response from you, so if you can maintain your composure, you will greatly thwart a major goal your child has in the behavior. During this time, think through the situation. What was misused? Think of a consequence that goes along with the situation. Think about what types of consequences you will use in situations. If your child has a consistent behavior problem, think through how you will respond in those situations. Think it through when you are not in the heat of the moment. Think about it in times of non-conflict. Have some standard consequences if your child has you stumped. “You need to go sit on your bed while I think about this situation” is an okay thing to say to your child. You will have an easier time responding in the moment if you have an idea of your policies before the moment arises. As you are thinking ahead of what you will do, also think about what you will not do. You want to be sure you have banned yourself from certain things. Don’t give idle threats you could not and would not ever fulfill (for example, if you hit your sister again, I will bite your fingers off. That isn’t getting you anywhere when that hit inevitably comes again–and this is a real-life example I have heard used). Also, don’t promise things in exchange for better behavior. This starts a pattern and a habit of your child knowing if he or she holds out and is disrespectful and naughty that he can soon be promised a treat of some sort in exchange for his good behavior. I find it helpful to read through books on discipline to keep my head in the correct frame of mind for what to say and what not to say. I really like Parenting with Love and Logic for this purpose. I don’t necessarily agree with everything I read in that book, but I like a lot of it and he helps me be more ready for those crazy parenting moments. It is okay to say, “I need a minute to myself. I am going to go sit in the family room and think of a consequence for you. I will let you know when I know.” Often times, this is a dreadful situation to the child. You are off dreaming up a consequence while your child frets about what it will be. Sometimes the waiting is more of a punishment to your child that the actual punishment will be. Taking time to think gives you time to cool off. It also gives you the opportunity to ask like-minded parents for advice or guidance. You can talk to your spouse about it. If you don’t know the right action to take, take time to think it through. You are not required to react at that very moment. Your child will remember the negative behavior in two hours. She remembers a promise for a treat, correct? Children are not dogs. They are far more intelligent. You can also ask your child for ideas on what he thinks the punishment should be. Any time I have done this with Brayden or Kaitlyn, they have always come up with a punishment bigger than I would have done. Always remember in your disciplining to remain calm. Keep your personal emotions out of it. Don’t take behaviors personally. In your response, remain calm. Sometimes you will say or do the wrong thing. You are a human and you will make mistakes. When this happens, retract if needed. Go to your child and say, “I was thinking about the consequence I gave you for xyz and I realized it was not appropriate for what you did. I apologize. An appropriate punishment is abc.” It is not only okay but it is good for our children to see that we make mistakes sometimes, too.